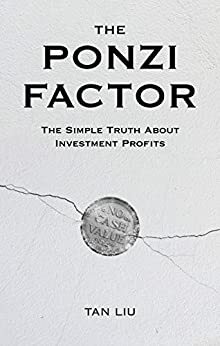 The stock market is similar to a Ponzi scheme because it is a system where the current investors&apos; profits are dependent on the inflow of cash from new investors. The myth is, profits from stocks come from the earnings and growth of the underlying company. The reality is, profits from buying and selling stocks come from other investors who are buying and selling stocks. When one investor buys low and sells high, another investor is also buying high and needs to sell for even higher. The truth really is just that simple. But, some of you might be thinking, "But stocks are ownership instruments, some stocks pay dividends, some companies buy back shares, people have made money, etc." I&apos;m familiar with those ideas because I used to work in finance and defended the legitimacy of the stock market with those same textbook responses. But then, I thought about it for many years at very deep levels--researched the history of stocks, studied S.E.C. filings--and realized that there is a massive difference between the textbook ideas from school and what actually happens in practice. People also have a tendency to rationalize and ignore the obvious when it goes against what they want to believe. The outcome of the years of meditation is this short book that explains the simple truth about how stocks really work. It doesn&apos;t matter if you love stocks or hate them. You should know the truth about where your money goes the moment you buy a stock. You can read this book to be a better gambler or read it to avoid the world&apos;s biggest scam. You will learn something unique here that you will not find elsewhere, and you will never forget what you learn. True ideas will never disappear. It can be covered, and we can get distracted, but the truth never goes away and becomes self-evident over time. This is not a story that will disappear after another market crash. It is an idea that will remain relevant for as long as the stock market exists. 5.0 out of 5 starsRead it!. It is worth the very modest price the author is asking. I am giving it 5 stars instead of the 4-4.5 because it is refreshing to read something that was NOT combed over by an entire team of ghost writers and editors. Most of the time when you read non-fiction these days especially anything to do with the social sciences it comes off so polished it lacks any unique voice of the writer. This small book reads a bit like a long form blog and sort of takes the form of a novel, which I am entirely okay with, as it contains personal accounts of what actually happened to the author. He confirms a few of the suspicions I had already about the Finance world. I have a Bachelors with honors in Economics and did a post-graduate certificate in Resource Economics. Being a micro-girl I do not have much background in the macro world of finance, or money and banking, but my understanding of how it is supposed to function in theory is better than the average person. That is financial markets are not some magical place where money grows on trees to me. I have a general understanding of the theories behind them. Most of my college days were spent deep in matrices, data and cost/benefit reports. I remember the kids from the Business school attached to our university were required to take one of the same statistics courses I was. Back then I remember thinking their ideas ran so counter to just about everything modern economics has to say about how people and economies function it seemed like everything they knew about the economy came from some 1970's or 80's textbook. Since three quarters of the class were actual statistics majors or in the economics department like myself, there was a lot of eye rolling and making fun of the business students. In our topsy turvy world however after college, the objects of our amusement were going to be the ones in charge of vast sums of money after they graduated. Whereas I would be lucky to get some low paying government position at a utility, or some temp job advertised "business degree prefered, degrees in other fields will be considered". From what I could see from the perimeter the business world seemed like nothing more than just a giant propaganda machine. Business school seemed more like a brainwashing factory rather than a real academic pursuit. I have grafted my own personal experiences onto this book so far, and I literally imagine the authors bosses and colleagues as some of my old classmates. Going to school in Montreal a fair number of classmates were rich Americans who are most certainly busy managing hedge funds and ponzi schemes right now. To be honest I am only half way through but thought I would leave a review as there don't seem to be any here. I will edit this later if I feel it requires it. I like probably most people reading this was drawn to the book based on a slick youtube ad. 5.0 out of 5 starsAn Interesting Book By One Who Claims To Know. Worth Reading. I'm going to let author Tan Liu tell you why he wrote this book. It was to tell you that " . . . there is something fundamentally wrong with an industry that has convinced investors they are entitled to $30 trillion that doesn't exist" (pg. 132). The industry he is talking about is the stock market, in which that amount of money is alleged to exist, when in reality the amount is NOT dollars. It is Market Value that can disappear overnight. According to the author too many people make the "Universal Error" of mistaking Market Value for real $$s. What is fundamentally wrong (says Tan Liu) is that the Market has become too much like a Ponzi Scheme. On pg. 43 the author displays two graphs that bear similarity. One is that of hedge fund HB Onyx performance between Jan. 2006 to Nov. 2007. The graph shows that performance was above that of Standard & Poor's index, and suggests that the fund was making money and in good shape. The other graph is of the performance of (felon) Bernard Madoff's fund between 1990 and 2008. That fund also shows performance above the S&P index and appears to show a steady profit. The problem is that neither fund was in good, profitable condition. HB Onyx was using accounting that was LEGAL, and yet misleading. And of course Mr. Madoff's accounting was misleading AND illegal. The author's point is that things in finance that are legal can be just as damaging as things that are illegal. The author notes that certain big, successful businesses pay no dividends. (Stockholders expect to profit via capital gain upon sale, or via hoped- for future dividends). Author Tan Liu believes that profitable businesses should have to pay dividends. He also suggests that if 'finance professionals' lose money for their clients, the pros must pay back fees and commissions to those clients. Reviewer's comment: Fat Chance!! (And the author knows that). Author Tan Liu calls attention to investments that are (1), Positive Sum; (2), Zero Sum; and (3), Negative Sum. He explains them. He recommends against investing in stocks that are #s 2 and 3, while explaining why. 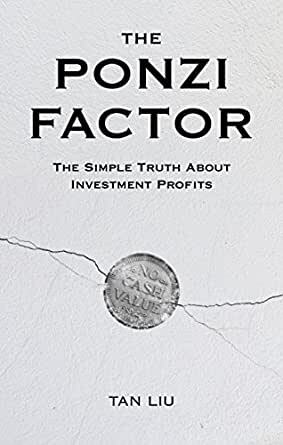 <The Ponzi Factor> contains Lexicon, End Notes and References. I usually look for books off the beaten path. The prior reviews of this book caught my eye. Got the book for a great price and gave it a shot. No regrets! It's well-written. In a world full of ghostwriters, where every book sounds the same, the author maintains his own voice and personal style. It's an easy for readers who don't know finance. There is a little bit of repetitiveness across the book but I give the Author credit for reinforcing his observations. I really wish the author spent more time discussing solutions...hopefully he'll write a Volume 2 or sequel on how to solve the issues he raised in this publication. I saw the trailer and thought the message was clear. I wasn’t sure if the book would be similar or get too technical, but it turned out to be a very well written book and easy to understand. The author put a lot of thought behind the words. This is not just another story about the stock market being a ponzi scheme. This is about how bad ideas can be seeded and spread over time, and how our universities can even adopt and teach those bad ideas. I'm surprised to see that this is the author’s only book, but I think this is going to be a classic.